For many people, their broadband connections are their lifelines. 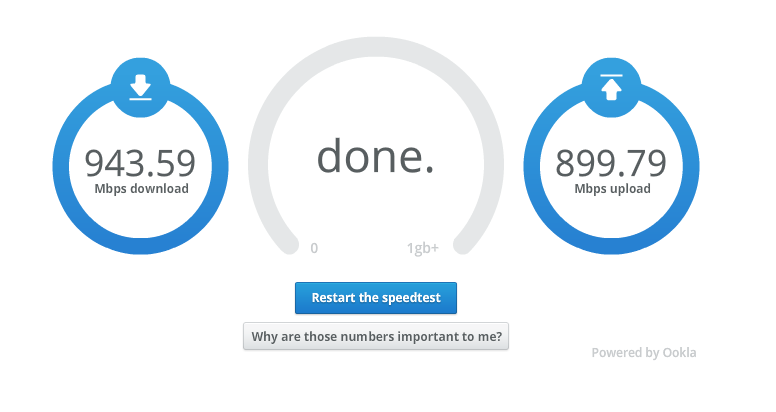 So what is the state of broadband in the U.S.? Well, when it comes to speed and price and adoption, we’re certainly not a leader — “middling” is a better way to describe our position. Currently 119 million people that live in the U.S. don’t have broadband connections (for many reasons, including not wanting it or not being able to afford it) while 19 million don’t even have the option to get it. Our rate of broadband adoption (62 percent) lags behind countries such as South Korea, the U.K.,and Germany, according this year’s Federal Communication Commission report. (We’re closer to the penetration rates to Japan, Finland, and Canada.) These numbers are not likely to change soon, given that broadband growth is slowing and providers are moving away from wireline infrastructure. Pricewise, we’re not in the top 10 in any speed tier, and in the in the highest tier — 15-25 Mbps — we’re 26th out of 32 countries. Hong Kong and Denmark both have cheaper internet — and faster average broadband speeds. In this infographic, we highlight some key facts on broadband in the U.S. We obtained the data from the FCC, the National Broadband Map and Akamai. Green denotes areas with at least two wireline broadband providers. Click to see how well your area is covered by both wireline and wireless broadband providers. Source: National Broadband Map. The vertically integrated monopoly carrier model is failing us. We need to learn from the lessons of the 1980s and 1990s and develop the networks horizontally across infrastructure/access (lower layers), control and settlement (middle), and marketing and application (upper) intranets and exchanges. Google has the best (albeit not perfect) approach via KC fiber (the anvil) and Android (the hammer) to smash the inefficient, vertically integrated carriers. Why is this a given? Because the former has pricing that reflects competitively driven and scaled marginal cost, while the latter’s pricing is driven by average cost. The former amortizes investment and clears rapidly shifting supply and demand, which the latter does not as we are clearly seeing with wired broadband access and inefficient investments in 3 and 4G. This map totally overstates access, There is no wired service whatsoever outside of county seat and it has just about our entire county as served by wired. All there is is line of site wireless. And don’t even get me started on the cost of wireless in rrual regions versus wired in cities. Carolyn, the cost of rural broadband could come down significantly if the carriers amortize demand over indigenous mobile, transient mobile and fixed beyond the 2-4 mile perimeter of most rural community cores. Those are 3 revenue streams that did not exist for 2 or 3G digital. All you can eat wireless voice pricing from the late 1990s/early 2000s killed the prospects for 3G broadband in rural markets. There were was no efficient way to monetize the urban transient traffic. Given the rule of large numbers I estimate that (sub)urban demand nearly doubles the effective revenue in rural markets. Assume 10% rural base and 10% of the urban/suburban base is invariably transiting through or to the rural markets. When data wasn’t that important it didn’t matter for we (sub)urbanites. Now with 4G smartphones it absolutely does. Not sure how long it will take, but with datacaps from AT&T and VZW (albeit very expensive) and some introduction of competitive mid-mile broadband via government stimulus (BTOP) we’ve at least begun the process. No one has pointed out the sheer size of the US as it relates to other countries – for example you frequently hear that ‘Europe has better roads’ because they need 1/16 of the infrastructure we need here, so it’s inherently better. Let’s not forget Chattanooga, the first city with 1Gbps access and with the starter package at 50Mbps. Not everything depends upon Google. Looks like North Dakota is the state to live in for broadband access. Too bad we don’t have decent broadband here like some of those other countries have. 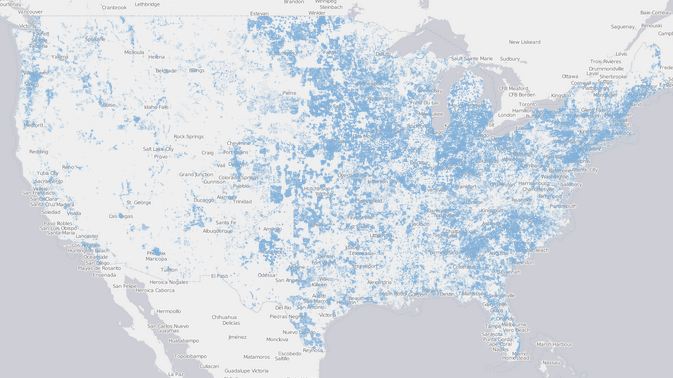 Great post – interesting to consider the similar maps that represent wireless spectrum allocations and investments. A very detailed view into the demographics. If anything, the US National Broadband Map overstates access, adoption, and speed while understating cost and price. This is because the research upon which it is based suffers from a methodology both flawed and inconsistent, whose results tend to skew positive when compared to better constructed measures. For this, we can “thankâ€ the same hegemonic government-industry partnership that “achieved” such a mediocre outcome at such expense.